Plank flooring is an older and more traditional flooring option, but it’s recently risen in popularity. This flooring style is exceedingly versatile and available in a wide array of colors and styles as well as solid and engineered wood floor options. When making your own flooring decisions, you’ll need to consider the benefits and drawbacks of solid vs. engineered wood flooring. Generally speaking, wherever you expect a significant amount of moisture or temperature fluctuations or if you’re fitting the floor over underfloor heating, your best option is engineered wood flooring. Engineered wood floors are also frequently cheaper than solid wood floors. Free-standing tubs or soaking tubs are one of the newest trends in bathroom design. These types of baths are well suited for modern vibes or vintage chic looks, with many versatile styles for you to choose from. When it comes to placement of your free-standing tub, the options are endless. Place it in the alcove of your bathroom to create your own secluded space, or up against a tile or textured wall for an elegant and sophisticated look. Grey is an incredibly soothing and neutral color. Because grey is neutral, it’s easy to pair with virtually any piece of furniture or fixture. Going monochromatic and adding a dark grey couch to your living space or sleek, grey countertops adds class and elegance to your kitchen. It also leaves you room to add a statement or accent piece to make the room pop. Cool, neutral colors and undertones give your home an aesthetically pleasing and distinctly modern vibe. Linear fireplaces are another instance “mid-century modern” coming back into style. Unlike traditional fireplaces, these use clean-burning natural gas and you can install them in practically any indoor or outdoor setting. Linear fireplaces are great for outdoor lounging areas or in between two adjoining rooms, to add a luxurious and elegant feel to your home. There are four primary types of paint finishes: flat, semi-gloss, gloss, and eggshell. Gloss and semi-glosses have always been the traditional go-to’s, but eggshell and flat colors have risen in popularity recently. You might think that selecting paint type is relatively simple, but many problems tend to arise when there’s a miscommunication between the painter and the homeowner on sheens. A lot of modern homes might opt for flat on walls, but it’s not recommended for most as it is impossible to clean or touch up. In fact, we hear that due to new EPA regulations and new formulas paint is becoming harder and harder to touch up. Minimalism is in. An increasing number of homeowners and designers are embracing less busy designs, in favor of more sedate color and pattern selections. This applies to wall texturing too. The go-to choice is typically a neutral colored and smooth textured wall. Gone are the days of faux finishes. Exposed steel falls into the same trend or aesthetic category as reclaimed wood. These are intentionally industrial looks that more designers and home buyers are choosing to embrace. The idea is to highlight the honesty of the building material. This isn’t about being polished and pristine, it’s about highlighting the structure and original finish of a material. Like exposed steel, reclaimed wood is an industrial home decor trend that’s become increasingly popular. Using reclaimed wood in conjunction with exposed steel and matte or bronze finishes creates a juxtaposition between warm and cool tones and vastly types of textures and patterns. Many homeowners also tout the fact that reclaimed wood represents a conscious choice to recycle as opposed to using more resources and buying new. These finishes are most applicable to fixtures and industrial or mid-century modern style furniture. Matte black an industrial color and finish, while satin and polished brass finishes are more mid-century modern. Matte colors and finished mute a room and add some edginess in a very modern way. Brass finishes do the opposite by acting as highlights that add warmth and interest to a room. The idea is to create a contrast between the bright, warm focal points and cool, dark, edgier textures. Open floor plans have come back into style over the past several years. Everyone is breaking away from traditional, walled-off interior layouts. The obvious benefit of an open floor plan is that it opens up space in your home by connecting the dining room and living room areas. This leads to a more open, airy and spacious room. Glass partitions and glass curtain walls are some of the most dynamic and versatile upgrades you can make to your home. 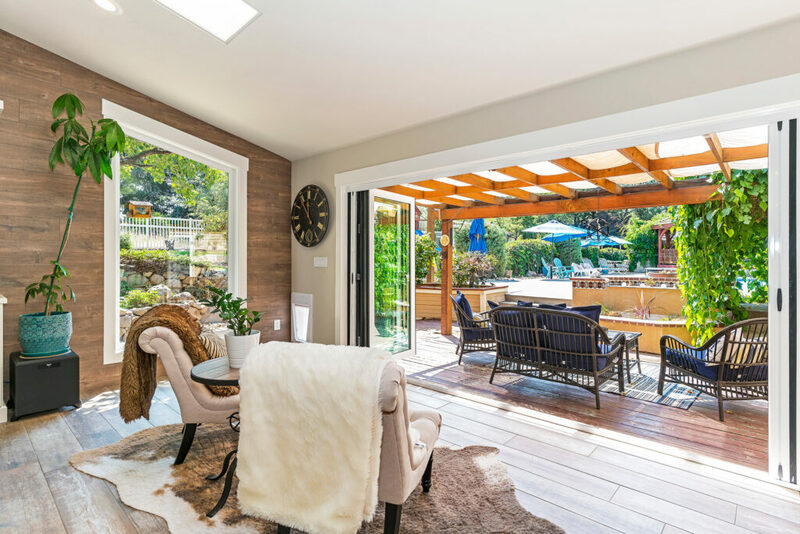 These large, movable glass installations are open up a room to the outdoors and let in more light – they’re the epitome of an open floor plan. Many of these systems are modular, meaning that they fold or recess into your home’s walls. The only drawback to these systems is that they may not be applicable for use in every home. These glass systems are not load bearing and are only for replacing walls that don’t already provide structural support in your home. In some instances, your general contractor may be able to install steel posts and beams at the opening to reinforce the structure. Before doing so, you’ll need to consult an engineer and acquire the proper permitting. Barn and rustic style doors are in vogue, rising to popularity through HGTV type television shows. Like glass curtain walls, sliding barn doors are versatile and dynamic door solutions. Their unique look and ease of use are added benefits. Not only are sliding barn doors multi-use, but they add a rustic chic look to any room. At Kirby Construction we exercise great care in shepherding you through the custom home building and remodeling experience. We commit ourselves to honesty, integrity, and craftsmanship. Your satisfaction is our goal throughout your journey. We’re here to help with everything from pre-construction services and new construction to remodels and additions. Get planning with us today!